The Neel Parent Advisory Services Inc./ The Neel Center is launching their online ‘Buy a Brick’ fundraiser campaign in order to raise the funds to ensure a permanent home for The Goodwill V.I.N.T.A Ambassadors. In the City of Heseperia Ca. Even with the inconvenience of not having a real place to call home. The members continue to work on their amazing projects, using their passion for the Arts to bring attention to such issues as bullying, literacy, world hunger, homelessness and pollution. THE STARWALK PROJECT is our way of showing our appreciation and to honor the celebrities, notable individuals, businesses from around the world. That have participated in one or more of our projects, provided us with wonderful and insightful words of wisdom, and random acts of kindness over the years. Which has inspired young people since 1999. We have two ways you can be apart of this project. You can be an ANGEL in the “On the Wings of Angels” Garden Vignette or you can be apart of “Walking among the STARS”. Your brick will be permanently displayed within the walkway that will go throughout the property. The walkway will be made up of celebrity bricks, six garden vignettes, and eighteen famous inspirational messages to be seen by all who attend and visit the center for years to come. We sincerely hope you will join us in our endeavor of creating an oasis that will honor and celebrate the arts and diversity. Each dollar we raise will go towards the personalized engraving bricks and installation of the walkway, landscaping and to ensure a permanent home for the Ambassadors in the High Desert. This new facility will house our after-school Fine Art, Leadership and Tutorial Program, for young people with and without disabilities that are Aging out of Foster Care that reside in the High Desert of Southern California. The 7ft.x7ft. Three tier hexagon Garden Vignette will be at the main entrance of the center. 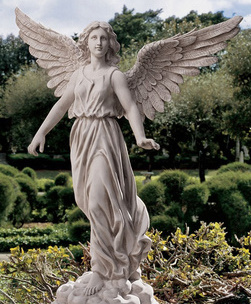 The Angel of Patience a sculpture by Design Toscano will be the centerpeice in this vignette. 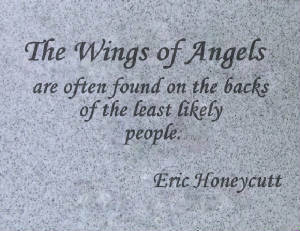 All "One the Wings of Angels" 8"x8" tiles will be permanently displayed will be within the vignette. (1) Limited Edition White TGVA T-Shirt per Tile. Lavender, Sweet Woodruff, Sweet Vanilla Butterfly Flower, Missouri Evening Primrose, Purple Love Grass, Golden Sedum and Apollo Dwarf Aster. Everyone will receive a; (1) STARWALK Certificate of Appreciation suitable for framing and (1) Limited Edition White TGVA T-Shirt per Tile. For those that wish to pay - $200.00 for (1) Gray Granite Tile. Ten individuals will be randomly selected to receive invitation for two, too our guest at our Star Studded Ribbon Cutting Great-Opening Ceremony. · Buy your brick on our website using PayPal. · Your transaction and information is safe and kept private by PayPal. 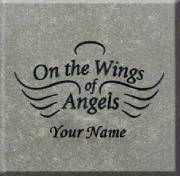 where you fill in the name to be displayed on your Granite Tile. Here is a unique opportunity to . . . Your brick will be permanently displayed among personalized engraved bricks of celebrities, notable individuals from around the world. The walkway will go throughout the property, six garden vignettes, and sixteen famous inspirational messages. The funds raised from 4x8 engraved bricks “Walking among the STARS” will go toward the installation of the walkway and six garden vignettes. Any remaining funds will help up date the furniture and state-of-the-art equipment. You can Buy a 4"x 8", 8"x 8" or 16"x16" Corporate Brick Arrays made up of (4) 8"x 8" Bricks. 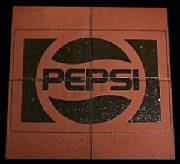 (1) Corporate Brick Arrays made up of (4) 8"x 8" Bricks or more. Corporation and Business will receive a STARWALK Certificate of Appreciation suitable for framing. (3) 10 company name will be randomly selected drawing where 10 companies of receive 10 invitation for two, too our Star Studded Ribbon Cutting Great-Opening Ceremony. For one (Corporate Brick Arrays) BRICK(S) - $750.00. Check out Brick Markers® USA free brick clipart. of message to be displayed on your brick and email it to negrp@yahoo.com . logos on our website, just add the logo at the of your message. and the location of your brick. To learn more about The Goodwill V.I.N.T.A Youth Ambassadors and their projects visit our website. Brick Markers USA will be handling the bricks for this project. 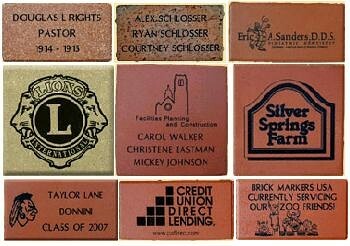 Brick Markers USA uses state of the art engraving laser technology. Our Brick Markers USA Contact is Ms. Kellie Wallace. To learn more about Brick Markers USA click on the logo below.